Haitian Prime Minister resigns amid fuel price protests – Royal Times of Nigeria. 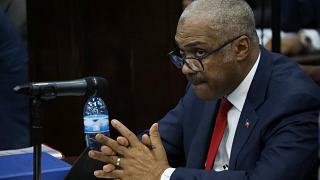 Haiti’s Prime Minister, Jack Guy Lafontant, resigned on Saturday after a no-confidence vote sparked by protests against the increase of fuel prices. Speaking to the lower house of Congress, Lafontant said President Jovenel Moise has accepted his resignation. Earlier this month, the Haitian government announced a reduction of fuel subsidies as part of an agreement with the International Monetary Fund (IMF), which resulted in a 38% rise in gasoline prices and 47% hike for diesel. The rise in fuel prices triggered protests all around the capital, Port-au-Prince, with demonstrators barricading roads, looting stores, and setting cars on fire.